Rural Drop In Session a success! 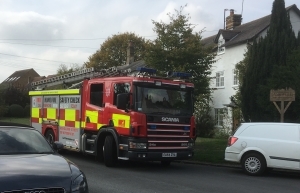 There was a great atmosphere at the Parish Rooms in Ashwell last Friday (05 October) when representatives from North Hertfordshire District Council (NHDC), the Police and the Fire Brigade gathered to host their first ever Rural Drop In Session. The event was well attended and offered local residents a wide range of information and advice on crime and rural matters and was a valuable opportunity to find out what issues residents and landowners may be experiencing in their local area. Issues raised ranged from fly-tipping, to free home fire safety visits provided by the fire service, arson in fields with haystacks, and bins being left out on the street. Cllr Tony Hunter, NHDC’s Executive Member for Community Engagement, said: "This was a great event with a number of agencies coming together with the aim of making our environment a safer place to live, work and visit. We were thrilled to see a good turn out and we received valuable feedback on issues affecting people’s local areas, as well as requests from residents asking us to repeat the event!" The organisations involved are hoping to roll these events out to other villages in North Hertfordshire.